Freeze cut banana pieces and blueberries for 2 hours. Remove and add banana chunks into the blender. Also add milk and blend it to smooth paste. 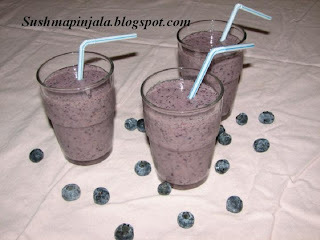 Now add honey, yogurt and blueberries and blend it further. Add more milk if needed and serve. Check to see what my fellow bloggers are cooking for BM 30. 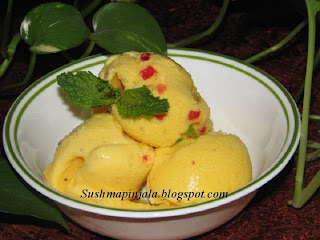 Also sending this recipe to Srivalli's Kids Delight event hosted by Mireille for this month. Boil milk till it becomes 3/4 quantity. Make sure the stove is on low flame. In a separate bowl add 3spoons custard powder and few spoons of cold milk. Mix well till the custard powder dissolves in it. Today we are starting with the 4th week of BM 30, for this week I choose my themes as Summer Special. For next 3 days I will be making summer special recipes. For day-1, I made Watermelon smoothie. 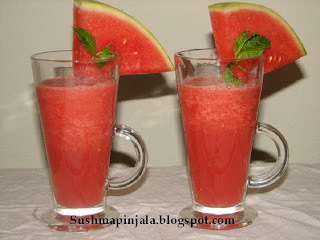 Add watermelon pieces, mint leaves, honey and lime juice into blender. Blend till watermelon pieces become smooth paste. Now add crushed ice and blend well. Serve immediately as it is already chilled or store in refrigerator for later use. 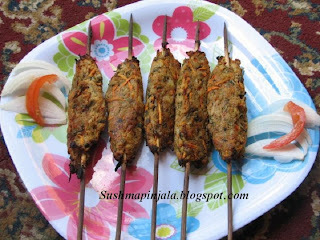 Kebab is a wide variety of skewered meals originating in the Middle east and later on adopted in the other parts of the world.In the Middle East, however, kebab refers to meat that is cooked over or next to flames; large or small cuts of meat, or even ground meat; it may be served on plates, in sandwiches, or in bowls. The traditional meat for kebab is lamb but depending on local tastes and religious prohibitions it may now be goat, chicken, fish or beef. Like other ethnic foods brought by travellers, the kebab has become a part of everyday cuisine in many countries. Today was a very tiring day. Was not in a mood to cook something for dinner. Had some left over roti's which I wanted to finish off. 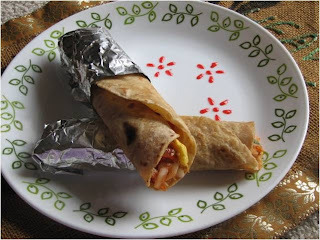 Made a very simple but delicious rolls out of the roti's and eggs. 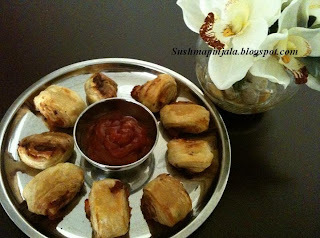 This is the recipe I got to know from one of my Bengali friend and its very famous in Calcutta. No much cooking needed, just make omelets, fill in the mixture and roll. That's it. Here's the 2nd day post for BM 30 under the theme " Get it Rolled". Beat eggs in a bowl, add salt and mix well. Used left over chapathi's here. You can even use the store bought frozen ones too. Heat skillet and grease it with little oil. Now add half of the egg mixture as omelet. Cook on medium to low flame. My kids love snack, more than the proper meal. Having 2 picky eaters at home I always think what to cook for them. My kids love all those crunchy and crispy snacks. Defrost the pastry sheets and place them on a tray. I have used to store bought salsa for this recipe. Spread the salsa on the end of the sheet. Roll the pastry sheet slowly and tightly till the edge. Cut them in to 1 inch thick pieces. Place each roll on a greased baking tray leaving 2 inches space in between the 2 rolls. Bake on 350 Degrees F for 20 to 25 minutes or till done. You can replace this sweet salsa with any spicy salsa too.